This model features fully automatic TTL operation, zoom, and bounce functions to help photographers fill shadows, add depth, avoid red-eye and improve image resolution. Zoom, Bounce and Swivel Head. Full burst manual mode. TTL auto focus, zoom position: 28,35,50,85, 105mm. Bounce position: 0/45/60/75/90°. Swivel: Left-180° Right-90°. This Flash Features Guide Number (ISO100/105mm) 58(m)/145 feet at 105 position. The kit has the green and blue filter and the wide angel diffuser. It is missing the red filter. 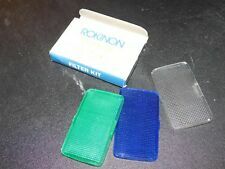 It has the original box as well. See the photos. No bracket is needed. Flash readiness indication in viewfinder. For Canon EOS. AF Dedicated. Multi Angle Bounce Head: 0/45/60/75/90 degrees. Power Zoom Flash. Zoom Position: 24-85mm. w/Swivel & LCD Readout. Works in Non-TTL mode. The circular pieces on the bounce hinge are missing. Bounce Flash Head. Includes Flash, original box, instructions. Red Eye Reduction Used through hot shoe. Guide Number: 24m/75ft TTL Auto Focus. Downloadable Products. For all Current Canon Digital Cameras with a Hot Shoe! Rokinon D950 For Nikon TTL Compact flash. Condition is New. Flash readiness indication in viewfinder. Multi Angle Bounce Head: 0/45/60/75/90 degrees. Zoom Position: 24-85mm. Guide Number: 45m or 148ft at 85mm position. Power saving function. Fully compatible with Olympus E450 E600 E620 E30 E3 E500 E510 E520 E420. Guide Number: 24m/75ft; TTL Auto Focus. Guide Number: 24m/75ft; TTL Auto Focus. Rokinon D980AFZ Power Zoom Digital TTL AF Flash w/ LCD. Auto Zoom, Bounce and Swivel Head. Nikon D40-D90. Nikon D200. Nikon D300. Nikon D700. Nikon D5000. Wireless Slave Flash capability. Up for your consideration a Rokinon 3200 D Dedicated Auto Thyristor Electronic Flash. Very Nice Condition! Happy E-Baying and Good Luck! Fully compatible with Olympus E450 E600 E620 E30 E3 E500 E510 E520 E420. Red Eye Reduction Used through hot shoe. Guide Number: 24m/75ft TTL Auto Focus. Downloadable Products. Power Zoom Flash compatible with all current Canon EOS camerasRokinon camera accessory features an autofocus assist lightElectronic flash powerful enough to extend your range up to 148 feetFlash works through the hot shoe of your cameraIncludes all necessary pins to sync with your cameraJust insert batteries, snap the flash to your hot shoe, turn on the camera, point and shootLCD status displayE-TTL II Auto FocusPower saverRed-eye reductionBuilt-in diffuser/reflecting plateSpecifications:Flash range: 148 feet at 85mm zoomZoom position: 24mm to 85mmBounce position: 0/45/60/75/90 degrees Swivel: 180 degrees left/90 degrees rightRecycle time: 0.5-9 secondsPower source: four AA batteries (not included)Dimensions: 2.8 inches x 3.9 inches x 4.9 inchesWeight: Approximately 9.5 ounces (plus. Case is in good shape. Rokinon 26 AD Flash for Minolta Camera~ Works Flawlessly! For your consideration we have a Rokinon 26 AD Flash Unit for Minolta. Works flawlessly! Pre-Owned, Filters have Minor Wear/Tear from Use/ Storage. No bracket is needed. Multi Angle Bounce Head: 0/45/60/75/90 degrees. Zoom Position: 24-85mm. Flash readiness indication in viewfinder. Red focus beam to assist in low light situations. Rokinon D900AFZ-C Digital TTL Zoom Flash for Canon (Black). This model features fully automatic TTL operation, zoom, and bounce functions to help photographers fill shadows, add depth, avoid red-eye and improve image resolution. This flash is in perfect working condition. I would be happy to help! Rokinon Shoe Mount Flash Model 26M - Works and ready to use! Rokinon Shoe Mount Flash Model 26M. Tested and working. Nice shape with light use. Look at the picture. Item is used but has been tested and it works great. See pictures for more details. For sale is 1 flash. Rokinon Flash, model 26A AUTO. Flash is working conditions and it is sold AS IS. Rokinon 26A Shoe Mount Flash. In good used condition. 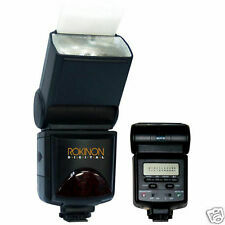 Rokinon Shoe Mount Flash Model 26M w/Box and Literature No Batteries - Works! No batteries; sold as is. And will do our best to resolve them. Flash IS IN ACCEPTABLE CONDITION. IT Has minor discoloration. Few scratches or scuffs. Look Over Pictures to Judge the Quality. I can usually respond within the hour. As with all electronics, this particular item is sold AS-IS. Tested: I installed two AA Alkaline Batteries and pressed the test button - it flashed just fine.